Early into World Boogie Is Coming the Dickinson brothers cover the blues classic "Rollin 'n Tumblin" but this ain't your grandpappy's take on the tune as a revved up sludgy 2 string guitar (whose body is a coffee can) riffs away before a banjo break, all this stomps around samples and turntable scratching; this is blues for the digital generation. 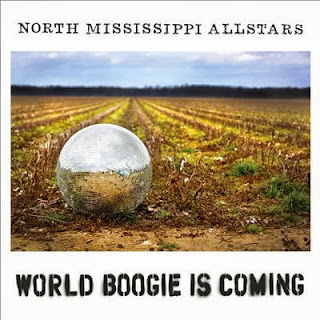 Not being afraid of experimentation, The North Mississippi All-Stars (Cody and Luther Dickinson) have created more of a feel disk then a structured album. With their last release, 2011's excellent Keys To The Kingdom, the band paid tribute to their late father with the best written songs of their career. On World Boogie Is Coming the songs are secondary, or third, or fourth...it is the vibe, soul, playing style and blending their hills country blues past with the future that takes precedence. Drum rolls end some songs and leisurely begin others like when the opening instrumental "Jr." flows into "Goat Meat" the latter getting spiced with Robert Plant's harmonica. There are lots of guests here helping the brothers out, everyone from RL Burnside's sons Gary and Duwayne to Sharde Thomas come to help the party along. Music blends with found sounds, like rain, footsteps, etc to give a field recording feel to things as the players tackle Hill Country Boogie like Junior Kimbrough's "I'm Leaving". The group is far from beholden to the originals though, putting a delicate sweet spin on another Kimbrough tune "Meet Me In The City" when they aren't digging into samples and loops. While this is a excellent document of the times and a snapshot of the countryside (especially with the video work done by Cody) the album as a whole isn't particularly long lasting or memorable when the boogie winds down. The best tracks here (the electro slithering cover of Burnside's "Snake Drive" and previously mentioned "Rollin 'n Tumblin") are worth returning too, but otherwise the testament itself speaks louder then any songs. Long time fans may also be disappointed that there isn't a killer Luther 6 string assault present but all the experimentation lends itself to the live stage where the brothers truly butter their biscuits. One thing that stands out is the most "rock" song here, "Turn Up Satan", sounds a bit half baked and it leads to wondering how this track would have worked if Luther was still playing with The Black Crowes. Hearing Chris Robinson wail on this one with some input from a set group of players may have enhanced it to greater heights. The rock roll will come later though as the NMAS have backwoods flowing through their instruments this time around. The brothers love their country, local people and most importantly the music and a disk like this will help the blues into the future while keeping it's past roots. The jammy-ness, digital samples and freedom may not be common in the blues but the boogie will never die.